Last year, we published two popular articles on preparedness. As I mention in the articles, I’m no hard-core survivalist, but I certainly believe in being prepared. We had planned a New Year’s day lunch for twelve, which meant quite a bit of food preparation. I was chef for the day. At 11:00 am, right after I had just begun searing a large pork roast with the intention of cooking it in the pressure cooker, the lights went out. I thought perhaps a circuit breaker had tripped. One glance at the power meter, though, and I knew there was no electricity on tap. So–although we’re not talking life and death here–I had a huge, raw (and frankly expensive) hunk of locally-raised pork to prepare, not to mention all the vegetables I intended to cook; no lights; no water (i.e., no toilet flushing); no auxiliary heat–and a herd of guests, all of whom had driven at least an hour’s distance, en route and looking forward to a delectable dinner. I didn’t even have time to call the power company to report the power failure. What’s more, as we live in the middle of nowhere, in a best-case scenario it would take the company at least two hours to get here…and on New Year’s Day? But I try to practice what I preach. 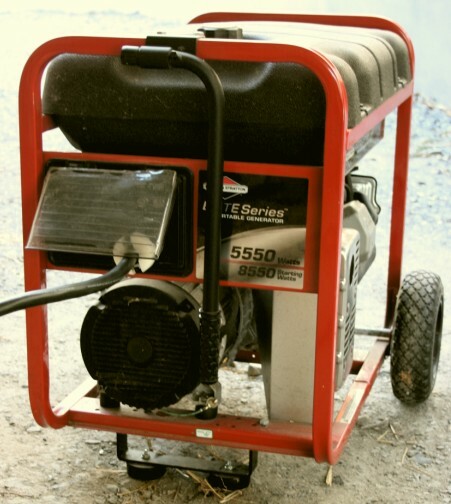 I have a 5550 Watt portable Genrac generator that we use in case of power failure –mainly to supply power to our water pump, lights, and a few appliances (like a microwave). It’s at least six years old, but works beautifully for those modest energy requirements. BUT: I had never tested the generator with the stove top. And looking at my raw dinner, and at the clock, I decided I was going to. No way was my nice cut of pork going to be crammed into our microwave. So I washed my hands, and zipped around the house turning off all unnecessary power loads and sensitive equipment (radios, computers, router, modem, lights, etc.). I then stepped outside, poured about two gallons of gas from the 10-15 gallons I keep on hand for emergencies into my generator, and fired her up. Though this unit doesn’t have electronic ignition, it did start almost immediately, because I test it every couple of months. I plugged the generator into our breaker box via an external junction and 12′, 240V cord that we had installed by a certified electrician earlier this year. 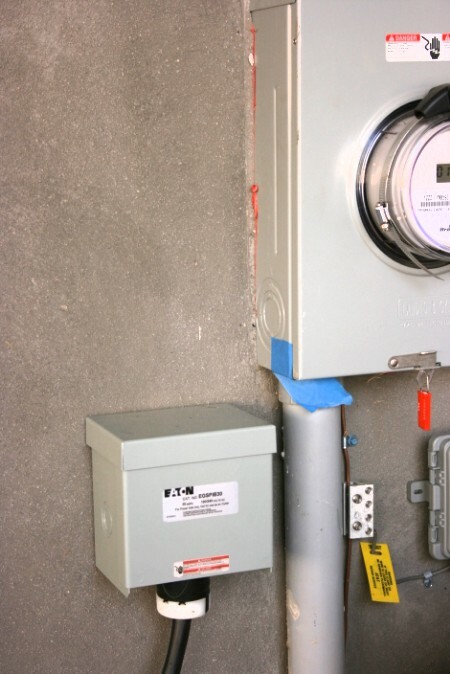 This system included a fail-safe switch that forces us to disconnect our house from the grid, prior to permitting the generator to do its job (lest our power hurt someone working on the power lines). I flipped the switch, walked back into the house, and saw that the generator had restored our lighting. Still, the lingering uncertainty in my mind was, “Will the generator power the stove’s burner so that I can at least cook the pork and veggies?” I listened to the generator hum as I turned the burner dial on…it barely strained. Whew! 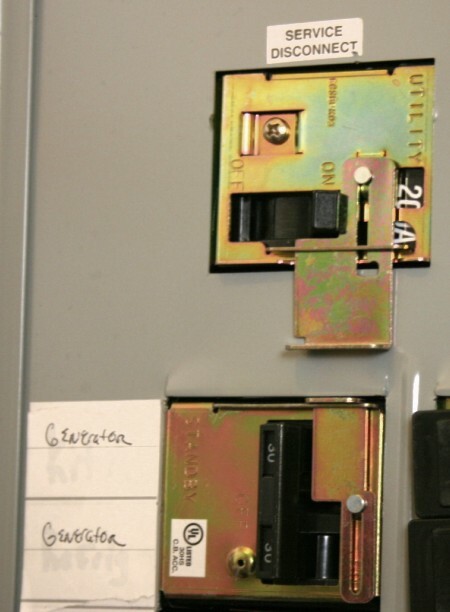 This switch, located on our breaker box, prevents the generator from being connected to the house while the grid is connected. Over the course of the next hour, guests started arriving; I continued to cook as if we had grid power. It was amazing. Everyone looked a little puzzled when they drove up and heard the generator running, but inside, found us enjoying lights, music, warmth, and the delightful aroma of the succulent pork and apples. Happily, the meal went off without a hitch. Mind you, I don’t think the generator could have handled the load of the water pump and the stove top if we didn’t have solar hot water and passive solar heating. An electric furnace and electric hot water heating elements in a traditional water heater would have simply been too much of a load. Preparedness is as much about testing and understanding the limits of what you have–running a few “real-life” scenarios to flesh out anything you might overlook in an actual outage–like fuel, a non-functioning generator, power cords, etc. And my radios? Not only will the generator power all of my tabletop receivers and ham radio transceivers, but I keep a separate 40 aH sealed battery fully charged, and at-the-ready, at all times. After all, every seasoned radio hobbyist who lives in a populated area knows that the best and quietest conditions for catching a little DX is when all of your neighbors’ power is out! Always keep spare batteries and power for your radios when the grid fails. Don’t just do it for preparedness’ sake, do it for your listening ears! Happy New Year, and 73s, friends! This entry was posted in Funny, Preparedness, Slightly Off Topic and tagged Preparedness, Preparedness Radios on January 15, 2012 by Thomas.